The Partnership Network is a network of intermediary, leadership development, and social service organizations that provide skill and knowledge building opportunities to the community development sector across the region. Partners of the network convened on for the first time on Thursday, July 13th at the Hill House Association to launch the quarterly convening of the network, engage in conversation about the deeper shared purpose of all partners, and announce the consultant who will be working on the network’s strategic plan. During the meeting, Chris Cooke of PULSE and Chris Koch of the Design Center introduced Michelle Walker of Walker Philanthropic Consulting, the consultant who will be working to develop a shared purpose, determine the strategy, and create the operational infrastructure for the network. The smaller committee of the network that meets monthly reviewed and interviewed consultants through an RFP process. Ultimately, the committee chose Michelle because her framework and approach and interest and excitement make her uniquely capable of taking on the important work of increasing synergy, collaboration, and communication among partners of the network. Those that provide direct services to residents in neighborhoods. This greater understanding of the partners of the network will lead to an honest and sustainable approach to coordinating, aligning, and collaborating in the capacity building sector. The next convening of the Network will take place on Thursday, October 12th 2017. Participating organizations include the Design Center, New Sun Rising, NeighborWorks Western PA, the Bayer Center, GTECH Strategies, Pittsburgh Urban Leadership Service Experience (PULSE), Coro Center for Civic Leadership, PCRG, Forbes Funds, and Program to Aid Citizen Enterprise (PACE). Neighborhood Allies Proudly Announces the Launch of the Real Estate Co-Powerment Series! A $75,000 Catalytic Grant Award to Omicelo Cares, marks the launch of the Real Estate Co-Powerment Series! Neighborhood Allies and Omicelo Cares are the co-creators of the Real Estate Co-Powerment Series (“Co-Powerment Series”) which will serve as an education platform to demystify the real estate development process, explain its associated terminology and demonstrate how community members/organizations can meaningfully contribute to real estate projects within their own neighborhoods. This pilot initiative will be a combination of in-class instruction, coaching, and mentorship. An overarching goal of the education series is to shrink the technical proficiency gap that exists between real estate developers and community leaders that are involved in local development projects. We hope to create long-term, working relationships between private developers, real estate experts, community based organizations, business owners and active community members. As the co-creator and primary administrator of the program, Omicelo Cares will produce the final curriculum, create two real estate course-tracks: one for beginners and another for those more advanced, administer pre-and post- class surveys, interview and hire instructors and monitor mentee/mentor relationships. Other key partners include the Urban Redevelopment Authority (URA), Pittsburgh Cultural Trust, Green Building Alliance and NeighborWorks of Western PA. The Co-Powerment Series will include 3 months of instruction specifically geared toward the participants’ projects. Each session will be a learning circle/workshop environment with the assistance of technical experts where the lessons learned become immediately applicable to the participants’ day-to-day leadership activities. Our goal is for at least 1 of the real-world projects to be developed after each course is complete. The pilot class will consist of 20 students (2 cohorts of 10) from neighborhoods on the cusp of significant change, specifically Neighborhood Allies’ 6 priority geographies (Homewood, the Hill District, Hilltop, Larimer, Millvale and Wilkinsburg) with the potential of having additional participants from other local neighborhoods. Students will be community residents, CDC/CBO staff members, non-profit board members, small business owners with varying levels of exposure to the real estate discipline. The kick-off event of the Real Estate Co-Powerment Series will be a city-wide conversation on gentrification on March 29, 2017 at the August Wilson Centre of African American Culture followed by a six week class for ten pilot students from April 18, 2017 to May 25, 2017. For more information on the Co-Powerment Series, contact Emily Hammers at emily.hammers@omicelo.com. Diana Nelson Jones/Post-Gazette: Chase McBryde, owner of Reanimated in Pittsburgh, paints a sign for a new Allentown business at Industry on Industry, a new incubator for artists and makers. Neighborhoods with business corridors, however underused they may be, have a built-in advantage over those without. As one of the former, Allentown is a place to watch. The vibe there is still faint, but it’s a 21st-century vibe, and it likely will get stronger. Allentown has a fortunate location, too, a few minutes’ drive directly up Arlington Avenue from Station Square on the South Side. During a thunderstorm Wednesday, about 20 people showed up at the former Bold Baking Co. on Industry Street to tour spaces being offered at half-price rent — $3 per square foot per year — for two years. The building provides room for about five artists, craftsmen and other career-oriented makers based on the money available to subsidize rents. Tenants can use another 30,000 square feet to expand, said Joe Calloway, founder of RE 360, a real estate company that owns the building and is headquartered there. The tour was part of the Industry on Industry program, another business-building incentive of the Hilltop Alliance. Hilltop Alliance is a nonprofit community development engine that advocates for a dozen hilly neighborhoods south of Downtown. Two years ago, the Alliance began subsidizing rents to fill vacant East Warrington storefronts and offering grants for businesses to improve their signage. It attracted eight new businesses — 70 percent of the owners are women and minorities — and anticipates two or three more this year. Industry Street is parallel to Warrington, two streets south. In exchange for subsidized rents, tenants will participate in a public art project for Allentown’s main street, East Warrington Avenue, with the Hilltop Alliance and a committee represented by the Greater Pittsburgh Arts Council, Neighborhood Allies, New Sun Rising, Local Initiatives Support Corp. (LISC) and RE 360. 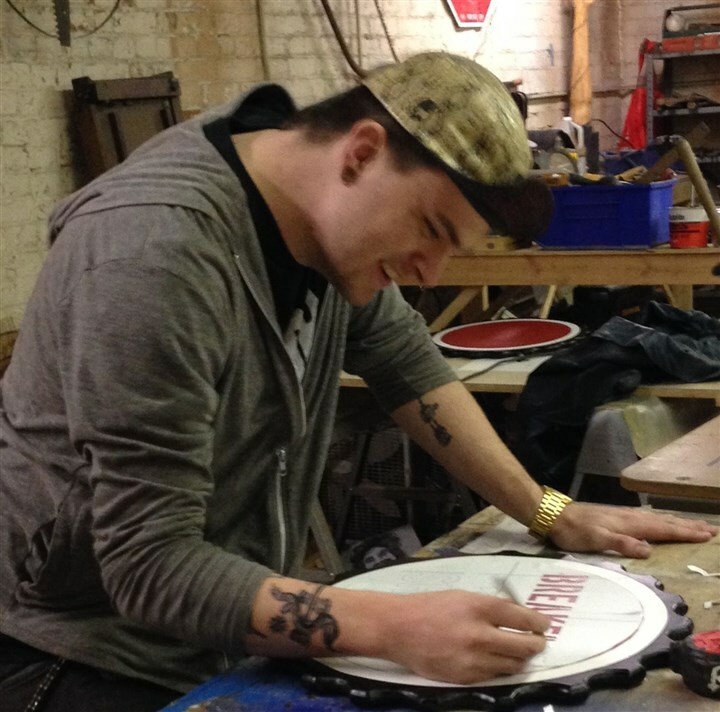 Chase McBryde is the first Industry on Industry tenant, operating as Reanimated in Pittsburgh, a fabricating and design studio. Its short name is RIPPGH. On the day of the tour, he was painting a sign for Breakfast at Shelly’s, a restaurant soon to open on Warrington. The doors of his workshop open outward, like a Halloween coffin, and he acknowledges a fondness for spooky symbols. But his is a lively business in yet another old Pittsburgh warehouse coming back to life. Gritty, peeling, scuffed, paint-stained and sawdust-strewn, with grimy windows and exposed ceiling insulation, it is one of those marvelous hulks that bears the vague post-industrial aroma that I never want Pittsburgh to lose. Ladders hang from exposed brick walls, century-old wood lath and stamped tin ceiling panels lay in piles. Eight-foot opaque glass block windows line one side. For much of this young century, I have followed Allentown through the eyes of its lifelong advocate and resident Judy Hackel. When Allentown seemed to have little to proclaim, she proclaimed it. She took me on walking tours. She pointed out beautiful architecture, the little retail that existed and the many well-kept homes, as if they were the exception. They were not. But blight and vacancy seemed to be winning. In 2014, every business on Warrington Avenue within a quarter-mile of a host antenna got free wireless Internet service with a $7,000 Urban Redevelopment Authority grant to Meta Mesh, a young tech company. That year, Allentown won a state Neighborhood Partnership Program award of $1.5 million over six years, a tax credit incentive to lure investors to struggling neighborhoods. With it came a full-time business district manager in Siena Kane. The deadline for applications to Industry on Industry is March 11. For more information, call 412-712-3306 or send email to siena@pghhilltopalliance.org. We are pleased to announce investments totaling $478,000 which will support creative, innovative, collaborative and inspiring projects and ideas that will help transform struggling neighborhoods into more sustainable, healthier, safer and stronger communities. A total of 7 awards have been made in the fall 2014 round, representing a new approach to investing in neighborhoods that supports innovative, resident-driven, comprehensive development and revitalization strategies and partnerships. “These financial investments, coupled with intensive support from our talented staff and dedicated partners will provide the needed resources to produce positive social impact and improve neighborhoods so that all residents are able to enjoy a better quality of life” says Presley Gillespie, Neighborhood Allies President. Neighborhood Allies plans to hold another Catalytic Grant funding round in early 2015. Awards were made in six priority communities across the City of Pittsburgh and into neighboring first-ring suburbs. Projects will address a myriad of local issues and opportunities ranging from neighborhood leadership and capacity, wealth building and access to healthy foods, to blight removal and workforce development and job placement initiatives. A full list of funded projects is below. • $65,000 Community WorkZ, Inc.: To build capacity and strengthen the leadership at community organizations in Beltzhoover, Allentown and Knoxville, and improve their ability to collaborate and execute neighborhood change initiatives. • $60,000 CARE Ownership: To implement a wealth-building program that trains and empowers existing residents in Larimer to become owner-occupants of multi-unit, formally blighted properties. • $60,000 Center that CARES: To launch Tech Central at the Jeron X. Grayson Community Center, which is a program that will address social and economic inequity by bridging the digital divide to 21st century technology and connecting the most vulnerable students to resources within the region and beyond. • $75,000 Farm Truck Foods: To pilot a mobile market program and food truck that provides universal access to whole, nutritious, affordable and local foods to residents living in food deserts or in communities with poor access to healthy food. • $68,000 Larimer Consensus Group: To hire the organization’s first staff person who will coordinate resident representation and action-oriented participation in the revitalization and development of the neighborhood. • $75,000 Millvale Community Library: To hire staff and increase capacity to guide current and future development and investment projects in a way that maximizes benefits for residents and improves community health and quality of life by implenting the community’s EcoDistrict Sustainability Plan. • $75,000 Trade Institute of Pittsburgh: To expand its facility and programming to address chronic unemployment in Wilkinsburg and Homewood and reach individuals who have spent time in prison, juvenile centers or rehab facilities. The program offers comprehensive, stable effective trade-skill and life-skill training, making students employable, and giving them a chance to increase their earning potential and obtain a job outside of the minimum wage job market.